This entry was posted in Art, Awards, Back door openings, Bliss Tips, Illustrations, liturgical art, Planting Seeds and tagged competition, fabric art, Liturgical Catechesis, liturgy, magazines, MaryA Livingston by MaryALivingston. Bookmark the permalink. Great story and one that reminds me that using your gift to praise God is priceless. So, when you submitted your artwork you gave them rights to publish what you had submitted? I think it’s great that you got your work published . . . just perfect for a December issue. And it is lovely! But I’m just wondering how this all works. Would you like to have known in advance that they were publishing it? Does the publisher run contests to solicit artwork? I understand how thrilled you must have been and that there are many artists that are willing to create sacred art voluntarily. But “Sister” is wondering about what is just . . . a just wage . . . and the proper place and appreciation of artists. Your work is great, and I hope this experience encouraged you to keep at it!!! That topic did come up for discussion. When the magazine came out I was participating in LIMEX and one of my fellow students was an attorney by day. I did read the fine print before I entered and knew the parent company had the ability to print submissions, with credit, of course. 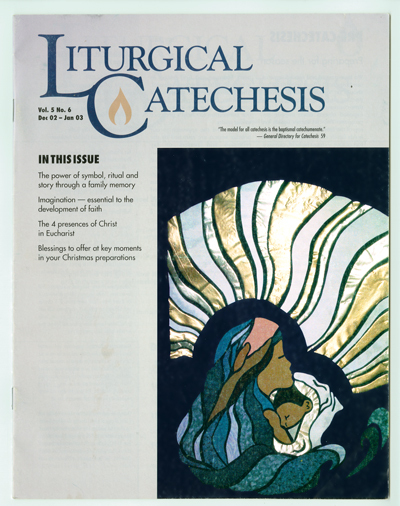 Whether that permission extended beyond the parent company of the magazine for entry (Ministry & Liturgy) to a sibling magazine (Liturgical Catechesis) could probably be argued. I do believe the publisher fully intended to use art from the contest in this way, based on the entrance statement at the time. Interestingly, today the publisher Resource Publications, clearly states “All entries are automatically eligible to be considered for future use on covers of Ministry & Liturgy magazine.” The wording was more vague in 2002. Well, surely it was great to published. A token stipend would have been icing on the cake! And I suppose all periodicals struggle to make a profit. I’m with you, Opreach. I would be offended that anyone, and especially a religious organization, would use such a contest to obtain free artwork. Every time artists let folks get away with using their work for free–and without permission–it devalues our profession. It’s up to us as a community to demand a fair wage for our work. As Suze Ormond says, “you are not on sale!” (I love that woman). Interesting enough, when I first read this post I thought to myself, I would be outraged if my work was used without permission, not pleased, and it looks like Opreach had a similar reaction. Just thought I’d throw in my two cents. Have a good one, Mary. Oh, gosh…When I entered the contest, I gave permission. When we voluntarily enter anything, we agree to the terms of entry. I do not have the terms this many years later, but I do recall the terms stating that ML had permission to print the images submitted. LC is run by the same parent company. They have since made the terms very clear that submissions will be considered for covers, so by submitting the artist is also submitting to be on the cover. Likewise, I still own the rights – so I can freely publicize that my work is on the cover. If we do not like the terms of a contest, we do not have to enter. I do appreciate the concern. I think this is why they have a more clear policy today. Artists, well anybody, entering a contest should always read the fine print. I have not entered some contests because of the fine print terms. Thanks for your concern and well placed points. The art is beautiful! Was this fabric, or painted on fabric? Nice to see your first published work and to see how it was used. It was all fabric. It was a transitional piece. Starting with a few rays of light, then water, then a hand pouring water…etc. It grew each week. Really eye catching art. No wonder that was picked for the cover. Brilliant work, Mary. There’s indeed a lesson here–great story and nice job. That is a stunning piece! It looks like stained glass. You are so clever and talented. Thanks for sharing this blissful story!